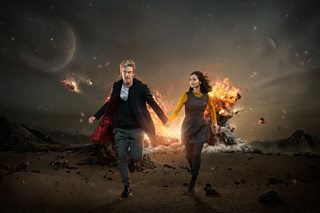 BBC Latest News - Doctor Who - Star Interviews and More about the New Series! Star Interviews and More about the New Series! We’ve got four great new interviews with the Doctor Who team! Get the low down from Peter Capaldi (the Doctor), Jenna Coleman (Clara), Michelle Gomez (Missy) and Lead Writer & Executive Producer, Steven Moffat. “Where is the Doctor?” When the skies of Earth are frozen by a mysterious alien force, Clara needs her friend. But where is the Doctor, and what is he hiding from? As past deeds come back to haunt him, old enemies will come face-to-face, and for the Doctor and Clara survival seems impossible…"
"Trapped and alone in a terrifying Dalek city, the Doctor is at the heart of an evil Empire; no sonic, no TARDIS, nobody to help. With his greatest temptation before him, can the Doctor resist? And will there be mercy?" Dalek city! Evil empire! Greatest temptation! What?! We can’t wait! Don’t forget, you can read interviews with Peter Capaldi, Jenna Coleman, Michelle Gomez and Steven Moffat and why not check out the trailer for episode 1, now!